The U.S. Fish and Wildlife Service confirmed that white sturgeon (Acipenser transmontanus) recently spawned in the lower San Joaquin River, California. Decreases in the San Francisco Bay estuary white sturgeon population have led to an increased effort to understand their migration behavior and habitat preferences. The preferred spawning habitat of other white sturgeon (for example, those in the Columbia and Klamath Rivers) is thought to be areas that have high water velocity, deep pools, and coarse bed material. Coarse bed material (pebbles and cobbles), in particular, is important for the survival of white sturgeon eggs and larvae. 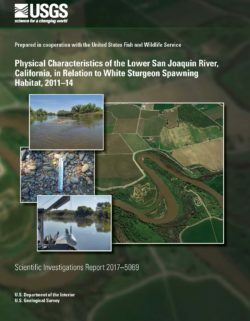 Knowledge of the physical characteristics of the lower San Joaquin River can be used to preserve sturgeon spawning habitat and lead to management decisions that could help increase the San Francisco Bay estuary white sturgeon population. Between 2011 and 2014, the U.S. Geological Survey, in cooperation with the U.S. 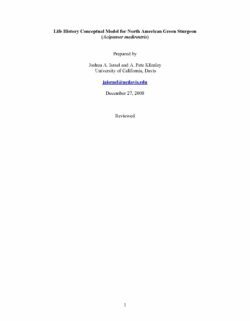 Fish and Wildlife Service, assessed selected reaches and tributaries of the lower river in relation to sturgeon spawning habitat by (1) describing selected spawning reaches in terms of habitat-related physical characteristics (such as water depth and velocity, channel slope, and bed material) of the lower San Joaquin River between its confluences with the Stanislaus and Merced Rivers, (2) describing variations in these physical characteristics during wet and dry years, and (3) identifying potential reasons for these variations. The lower San Joaquin River was divided into five study reaches. Although data were collected from all study reaches, three subreaches where the USFWS collected viable eggs at multiple sites in 2011–12 from Orestimba Creek to Sturgeon Bend were of special interest. Water depth and velocity were measured using two different approaches—channel cross sections and longitudinal profiles—and data were collected using an acoustic Doppler current profiler. During the first year of data collection (water year 2011), runoff was greatest, and gaged streamflow, measured as discharge, peaked at 875 cubic meters per second in the lower San Joaquin River. Also during that year, water velocity was generally between 0.6 and 0.9 meters per second, and depth was typically between 2.5 and 4.5 meters, but water depth exceeded 6 meters in several pools. Water year 2011 was classified as a “wet” year. Later water years were classified as either “dry” (water year 2012) or “critical” (water years 2013 and 2014). During the drier years, water was shallower, and velocities were slower. The streambed aggraded in several areas during the study. At Sturgeon Bend, for example, which had the deepest pool measured in 2011 (maximum depth was 14 meters), about 8 meters of sediment was deposited by 2014. The bed of the lower San Joaquin River was predominately sand, except in areas downstream from the mouth of Del Puerto Creek. A large amount of sand, gravel, and cobble was deposited at the mouth of Del Puerto Creek, and in the 9.5 kilometers downstream from the mouth of Del Puerto Creek, we encountered several gravel bars and patches of gravel-size (8–64 millimeters) bed material. Del Puerto and Orestimba Creeks drain from the Coast Ranges on the west side of the river. Only small quantities of gravel-size bed material were observed in the reach downstream from Orestimba Creek, indicating Orestimba Creek does not deliver much coarse sediment to the lower San Joaquin River. Del Puerto Creek appeared to be the primary source of gravels suitable for white sturgeon spawning in the lower San Joaquin River, and thus, it is important for the long-term spawning success of sturgeon in the San Joaquin River.